KUMANTONG FOR YOU: How Are Kumantongs Created? Spiritual Masters or Monks have to enter the forest and do a Summoning The Ghosts Ritual to search for Wandering Child Spirits(Or ghosts). Wandering Child Spirits/Ghosts who want to become Kumantongs are invited to enter their new homes, which are the Kumantong Statues. The Kumantong Statues, with the wandering Child Spirits inside, are then brought back to temple to continue the Kumantong Ritual. Spiritual Masters or Monks will continue the chanting ritual for 49 days to convert Wandering Child Spirits to Kumantongs. These Wandering Child Spirits will go through Buddhist Spiritual Cleansing. Kumantongs are wandering spirits/ghosts that got promoted to sort-of "Angel status". 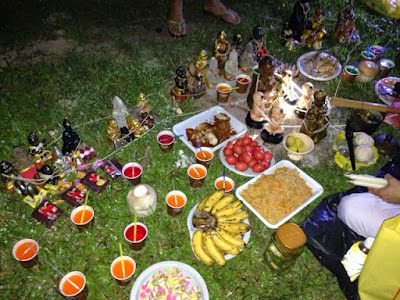 Kumantong Ritual will then continue to a total of 108 days to be completely empowered and ready to be invited by human folks as spiritual helpers. Kumantongs are now Little Angels that will help their human masters/keepers in every ways, be it business success, career success, STRIKE THE LOTTERY, block away black magic spells, fight against evil ghosts/spirits who are summoned by other Black Magic Masters to harm the Kumantongs' Masters/Helpers.